...as backlash deepens over the president's remarks on the tragic events in Charlottesville. Richard Trumka, a prominent manufacturing leader who heads the labor union AFL-CIO, said in a statement that he "cannot sit on a council for a president that tolerates bigotry and domestic terrorism." Trumka was joined by Thea Lee, an economist who's previously also worked at the AFL-CIO. 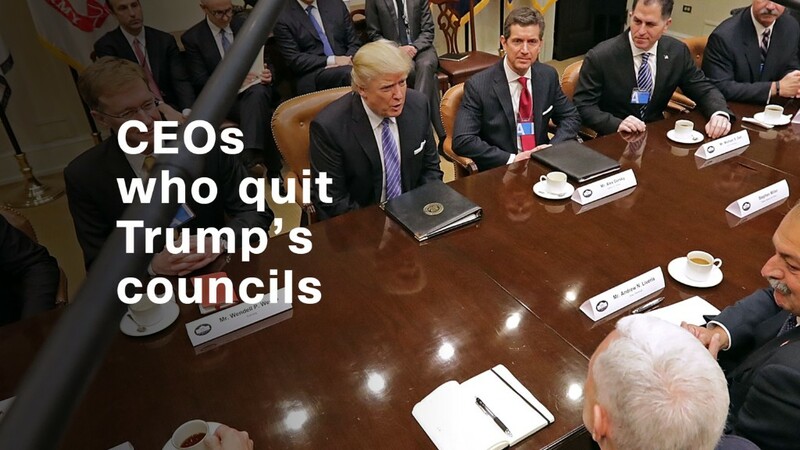 Meanwhile, the CEOs who remain on White House business councils have faced increased calls to clarify where they stand. CNNMoney has reached out to each member of these panels, and detailed their responses. New NAFTA, here we come? Not quite. But Wednesday will officially mark the start of the Trump administration's renegotiation on the U.S.-Canada-Mexico trade pact. The President has previously called it "the worst trade deal maybe ever signed anywhere. But a long road lies ahead: A new agreement isn't expected for more than at least a year, and even then, it involves about 14 steps that could be thrown off course by Congress, Mexico or Canada. U.S. Trade Representative Robert Lighthizer laid out the Trump team's objectives last month, with priority number one named as lowering the U.S. trade deficit with Mexico. Those who oppose Google's decision to fire engineer James Damore had initially planned to congregate outside Google's offices on Saturday. But on Tuesday, Jack Posobiec, who organized the events, said in a statement that he was calling them off due to "alt-left terrorist threats." Posobiec maintains that the rallies are peaceful opposition to what he views as censorship. Apple's "$1 billion war chest"
That's how much Apple has put aside to produce original content in the next year, sources tell The Wall Street Journal. According to the Journal, Apple (AAPL) may roll out 10 new TV shows -- to be offered either via Apple Music or an entirely new video-streaming service. The foray wouldn't be shocking: Apple recently hired two longtime Hollywood executives. As of early Wednesday morning, Apple hadn't commented on the report -- but that likely won't stop the media from buzzing over how it'd fare against Netflix (NFLX) or Amazon (AMZN). Your 20s are a great time to start getting into good habits about money, writes the Motley Fool's Maurie Backman. Check out these 10 financial moves to make in your 20s, from creating an emergency fund to deciding on graduate school.